We offer the best scuba diving and snorkeling Florida has to offer in the Florida Keys National Marine Sanctuary and John Pennekamp Coral Reef State Park. Uncrowded boats - carrying a maximum of 12 scuba divers, gives you a more relaxed and personal experience. We have an extensive range that covers the pristine virgin reefs in the North end of the park and the unmarked wrecks that are out of reach of many Dive Operators. Our fast charter boats will take you to uncrowded parts of the sanctuary where visibility and coral growth are superior. We pride ourselves in personal service as we take you to these beutiful sites on board our two custom 30 foot dive boats. Our personal attention to your adventures extends to our ability to arrange special dive sites on request - or ask our experienced crew to take you to where the conditions are best that day! 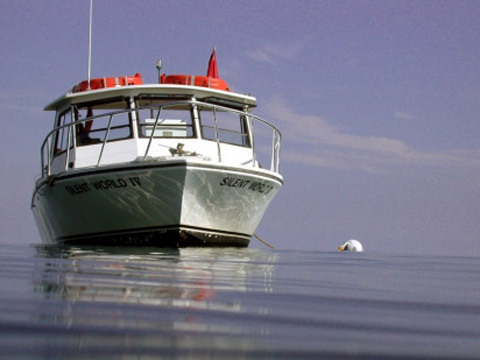 Our friendly crew and relaxed atmosphere will assure you of the best dives possible!